Here at Kinneir Dufort, we are extremely proud of our 80-strong, diverse and talented team. 21 of us are female; representing 25% of the workforce. This may not seem a high percentage, however compared to the industry average for Product and Industrial Design, and Engineers in Design at only 5%*; it’s a definitely a respectable number. Feminism is about equality. As a female Director in the Design industry, it’s a topic close to the heart of our Managing Director, Merle Hall. To help raise awareness of and celebrate International Women’s Day, we asked every member of the team — men and women — to note down their most inspirational women throughout history. The answers came back ranging from Beyonce to Marie Curie, Katherine Johnson to Oprah. 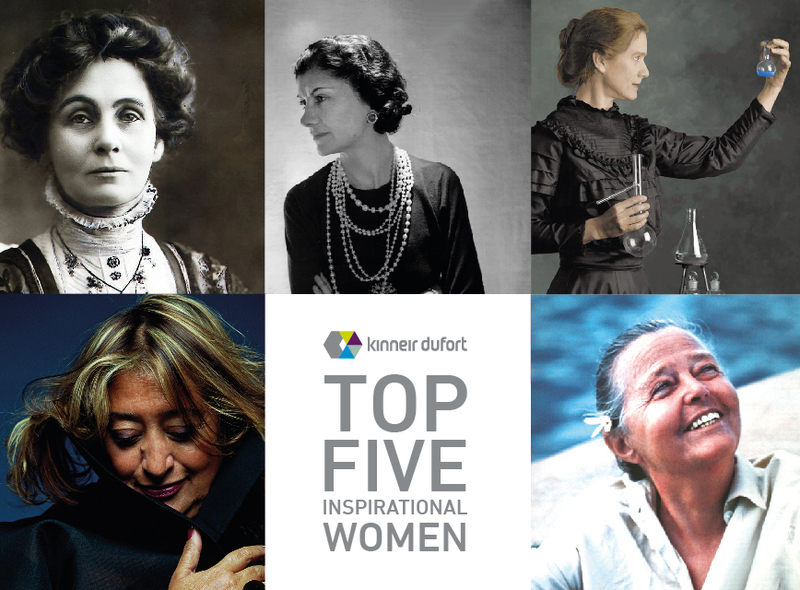 Below are our top five women throughout history who have inspired and amazed us here at Kinneir Dufort as well as the entire world. We have chosen women who represent different industries and achievements, from design and science – particularly relevant to our work — to women such as Coco (Gabrielle) Chanel who changed the perception of women through the way they dressed: allowing individual identity and self-respect. Due to their groundbreaking achievements, unbreakable spirit and determination to succeed in a world where that wasn’t always possible, today, on International Women’s Day, we thank these women for their trailblazing achievements that have allowed us to follow in their footsteps, as we make our own mark on the world, in an effort to create an even brighter future for women and men everywhere. Our hope for young women in Design and Engineering in particular, is that the barriers that once faced these five women will fade. That by inspiring and encouraging children to get involved with all subjects, they will find ones they relate to; be it science and maths, arts and music, or indeed design and engineering. Iraqi-born British architect. She was the first woman to receive the Pritzker Architecture Prize, in 2004. To discover more of our inspirational women, visit our website www​.kin​neirdu​fort​.com. Kinneir Dufort is an expert partner, working collaboratively with ambitious and progressive companies to research, innovate, design and develop world-class products and brand experiences. The expertise we offer is extensive; it encompasses in-depth Research, Creative Innovation, Human Factors, Design & Development, Mechanical Engineering, advance Technology and state of the art Prototyping. We create global award-winning solutions in healthcare, consumer goods, packaging, business-to-business goods and industrial products. *Design Council [8th March 2016].